Studying the education industry closely, it is observed that there is a wide gap between the learning that education imparts and the expected skill sets of students after completing the education course. Education IT solutions are aimed to bridge this gap by leveraging the potential of emerging technologies such as Augmented Reality and Artificial Intelligence. When experts of the industry analyzed the issue in depth, they figured out some key elements that are responsible for this gap in education. In this blog, we shall know how can education IT solutions address these issues. Advancements in technology can be utilized in the education industry for improving the knowledge exchange process. Students can feel more empowered with the new education IT solutions that impart learning just in the way desired by them. Online training where the uploaded video is used to teach lessons to students have not given good results. In response to this failure, education specialists have come up with another option of conducting live video streaming where teachers and students can interact with each other in real time. Educators can speak on selected topics and their followers can communicate with them in the live online space. The interactive atmosphere built by live video streaming solutions has proven results of improving engagement with students and making learning a two-way process. AR applications for education are the most popular education IT solutions. Invasion of technology in education has made learning interactive and collaborative. AR apps for education enhance the knowledge sharing process by making lessons more immersive, fun and engaging for students. It is possible for students to view 3D models of static diagrams through AR apps. Those who cannot imagine and learn on their own, AR apps proves to be handy. Augmented Reality technology is used to build education IT solutions that enable students to make interactive presentations or models. Teachers can use such apps in their classroom training to explain and highlight specific capabilities of a product. Robots powered by AI have the capability to generate high quality digital content, which helps to digitize textbooks and create customizable learning digital interfaces. AI-based education IT solution allows in the creation of digital curriculum (video and audio) and content to be accessed across a variety of devices with the help of an online assistant. Apart from helping students, AI-based education IT solutions also help institutions and organizations to automate or speed up administrative tasks by reducing the time spent on tedious tasks. This allows faculty members to spend more time on each individual student. Virtual online assistant help in tutoring a student based on difficulties they are facing while studying from the class material. These assistants break down the textbook material into flashcards and smart study guides for easier and fast learning. Related: How helpful are Mobile Apps in Education Industry? Several educational institutions have already adopted these futuristic technologies to improve the classroom teaching and learning experience. The final aim of implementing education IT solutions is to make students understand their lessons quickly, clearly and without much difficulty. 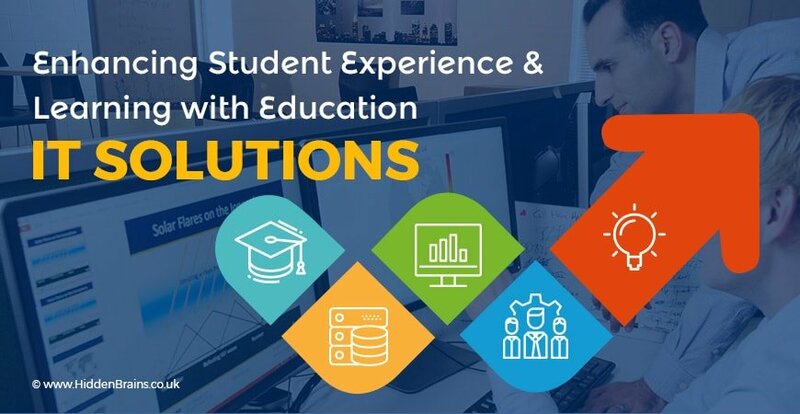 Apart from the education IT solutions mentioned in the blog, there are several others too that makes students’ lives easier and improves the way lecturers run their classrooms. Hidden Brains is a leading educational app development company helping educational institutes, tutors and students to improve the overall knowledge sharing process with effective education IT solutions. We give wings to your education system with innovative and unique e-learning practices, virtual classrooms, interactive distance learning programs and educational games. To get your customized education IT solution, request for an instant free quote now.